Alex Czinczel is a book-binder, model-maker, knitter, embroiderer and animator in brief. Her first solo exhibition, "El Burro Y Los Muebles" (The Donkey And The Furniture) comprised a short animated film screened alongside the window display of her knitted characters. Cacti, idiotic cats, rodents and a philosopher rabbit make an appearance in addition to the protagonist Burro. The photo-collage style animation tells the story of a donkey on an epic quest for furniture. His journey is littered with subtle humour and the layers of image provide countless surreal references. More of Alex Czinczel's work can be found here. TOM OF HOLLAND'S PORTRAIT OF DORIAN GREY. 2011 could become the year of the audio book, after we all get blown away by Tom of Holland's 'Reading Gloves' showing at Prick Your Finger from 10th February. Pictured here is Tom's portrait of Tom's knitted gloves, which Tom knitted as a portrait of the 'Portrait of Dorian Grey'. Please come to a private view of this and all the other glove portraits of classic fictional characters, on Thursday 10th February. JANET MORTON GETS ME GOING. Thank you Victoria Woodcock for sending me this beautiful picture of Janet Morton's 'Return Shift'. It has got me back on the keyboard and I love it. Louise was very brave. Fighting a fever, she put on her coat and hat, and braved the January weather to tidy up the back room at Prick Your Finger. Tidying up the back room has always been impossible - but we keep trying. At the end of Sandingham Road, she spotted the letter 'C', and picked it up. It was a useful fridge magnet, and she thought about who she could give it to. On Dalston Lane, she stopped to grab a take away tea at the Dalston Cafe. As she was waiting, she spotted an 'a' on the pavement, and picked it up. The tea made her feel a bit better and she started to walk a faster pace....until an 'n' stopped her in her tracks outside the Spurstow Arms. Picking up the 'n', she had the startling realization that she had just been told that she 'can'. I would just like to second that motion - Louise can do anything. Can any of you tell us what this tool is for? Pete brought it in the other day, thinking it was something for threading a needle. Pete's friend found it in her father's drawer after he passed away. It was made in East Germany, and has a flip out magnifying glass. A bullet shaped point thing and a bit with a fishing wire loop on the end, both of which fit into the main shaft. NEW EAST END KNITTING CLUB. If you are in the mood for finding new knitting friends for 2011, then get yourself down to Wednesday Knit at The Victoria, London E3, organised by Jackie, one of the busiest Prick Your Finger customers. Have fun! "Reading Gloves" brought together two of Tom of Holland's interests - knitting and romantic fiction. Together with his talent for making intricate gloves, the window display was comprised of short extracts from several novels accompanied by respective hand wear representations of the main characters. L.T. Tolstoy's Anna Karenina was displayed alongside a fine black lacework pair of longsleeved gloves in Shetland Ultra Cobweb. 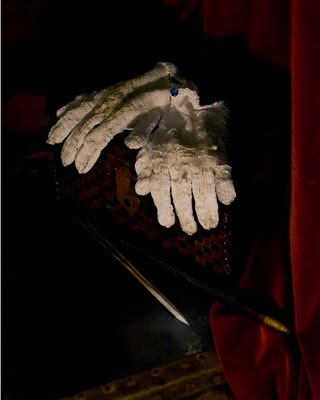 The Picture of Dorian Grey by Oscar Wilde was comprised of two parts - the immaculate gloves of youth and beauty below a framed photo of a pair of aged decreptit gloves. Lady Chatterley's Lover by D.H. Laurence inspired two pairs of gloves, a coarse gardener's pair and a delicate lady's pair. Tom of Holland's website is here.